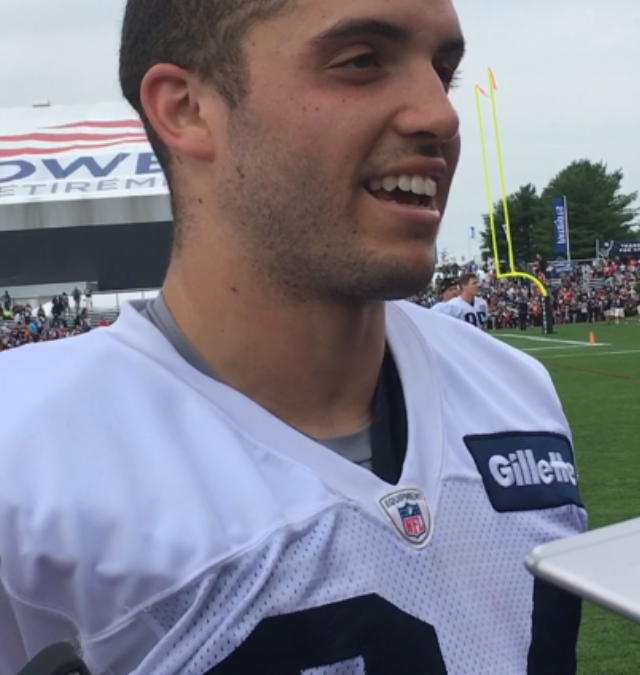 After the first official practice of the New England Patriots training camp, wide receiver Austin Carr was one of a few players (with quarterback Jacoby Brissett) that stayed on the field for additional reps after most of the team had left. For Carr, it’s almost like he’s starting all over again. To prove his worth as a valuable piece of a football team. The defending Super Bowl champions to be exact. At Northwestern, Carr joined the team as a walk-on. He eventually scrapped his way to a starting position and a scholarship before winning Big Ten Receiver of the Year during his senior season. Now, Carr is an undrafted rookie free agent on the Patriots. During the middle of practice, Carr trotted across the field with Tom Brady, Julian Edelman and the rest of the quarterbacks and wide receivers to begin a drill. The crowd cheered. Carr’s first day included a nice grab in the corner of the endzone over defensive back Will Likely on a pass from Jimmy Garoppolo in drills. The crowd cheered as Carr hauled in the pass, and the defensive backs were forced to do pushups as punishment. Carr made a few nifty catches on the day, but when asked about his performance, all he could do was praise the organization that’s given him a chance. Carr is attempting to make a team that is stacked with wide receivers. Among returning players such as Julian Edelman, Chris Hogan, Danny Amendola, and Malcom Mitchell is Brandin Cooks, who the Patriots acquired for a first-round and third-round draft pick. A blockbuster trade. That leaves likely five locks at a position the Patriots sometimes keep just five players, meaning Carr will have to shine.